At Feldhake & Associates, we believe that every part of your smile deserves to look its best. While teeth can be easily enhanced with cosmetic treatments like whitening and veneers, improving gum aesthetics can require more complex treatment. For patients experiencing gum recession, our Glendale dentists use the innovative Chao Pinhole® gum rejuvenation technique to improve the appearance of soft tissue and your smile as a whole. While often associated with periodontal disease, there are a number of factors that can lead to gum recession. From overbrushing and flossing to poor genetics, these conditions cause gingival tissue to shrink away, elongating the look of teeth. From a health perspective, gum recession can leave roots of teeth exposed and vulnerable to damage and infection, compromising overall dental health. Traditionally, treatment for gum recession requires surgical grafting to cover the exposed roots and reestablish the look of a healthy smile. In addition to requiring specialist’s care, the recovery time for soft-tissue grafting can be lengthy. However, innovation in soft tissue has led to the development of the Chao Pinhole surgical technique. What is the Chao Pinhole® Procedure? The Chao Pinhole® surgical technique is an alternative to traditional gum grafting. Rather than relying on donor tissue, scalpels, and sutures to correct gum recession, this modern treatment gently moves existing tissue into position. 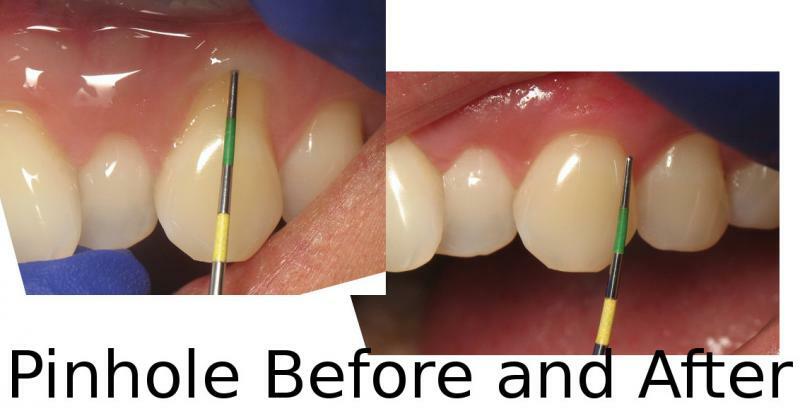 During the procedure, small needles create tiny holes in the gum above the area of recession. Specialized instruments are then used to reposition them to cover exposed roots and improve aesthetics. Once complete, small strips of collagen are placed in the treated area to help stimulate healing. After the strips have been placed, patients are free to return to their normal routine. At our Glendale and Scottsdale dental practices, this innovative treatment option allows Drs. Feldhake and Fulton to create beautiful smiles without using traditional surgical instruments. As Chao Pinhole® gum rejuvenation is minimally invasive, recovery time is fast and there is little to no discomfort following treatment. For nervous patients, sedation options are available to keep them relaxed during treatment. Our Glendale dentists are passionate about helping every patient achieve a beautiful smile through innovative treatment options. With convenient locations in Glendale and Scottsdale, Feldhake & Associates offers a number of treatment options tailored to every smile. To learn more about our cosmetic gum and dental treatments, contact Dr. Feldhake and Dr. Fulton today to schedule your consultation.